Gallia Academy sophomore Sarah Watts (6) races past an Athens defender, during the Blue Angels’ 1-0 setback on Tuesday in Centenary, Ohio. Gallia Academy senior Abby Cremeans (11) prepares for a shot, during the Blue Angels’ 1-0 setback on Tuesday in Centenary, Ohio. CENTENARY, Ohio — The end of the beginning, with a bright future ahead. 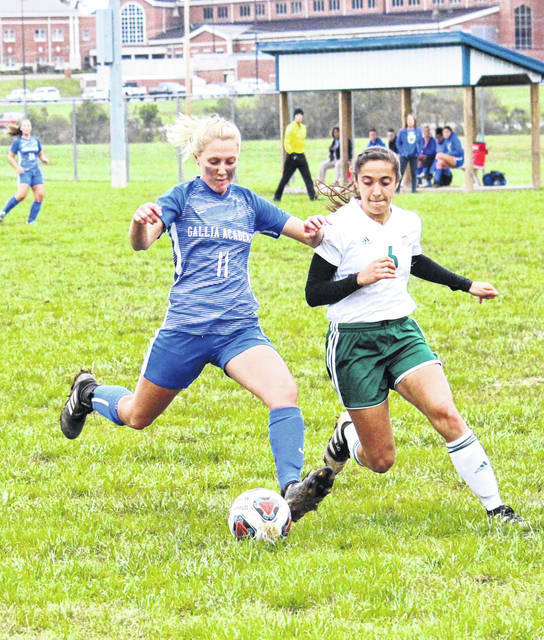 The Gallia Academy girls soccer team had its inaugural season come to an end in Division II sectional semifinal match on Tuesday at Lester Field in Gallia County, with sixth-seeded guests Athens pulling out a 1-0 victory over the No. 3 seed Blue Angels. 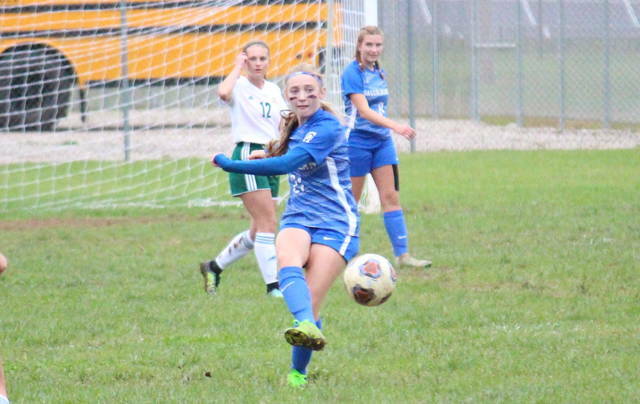 Gallia Academy (12-4-1) weathered the early storm, as Athens (4-5-8) fired seven shots on goal and earned a 4-to-1 advantage in corner kicks in the opening half. 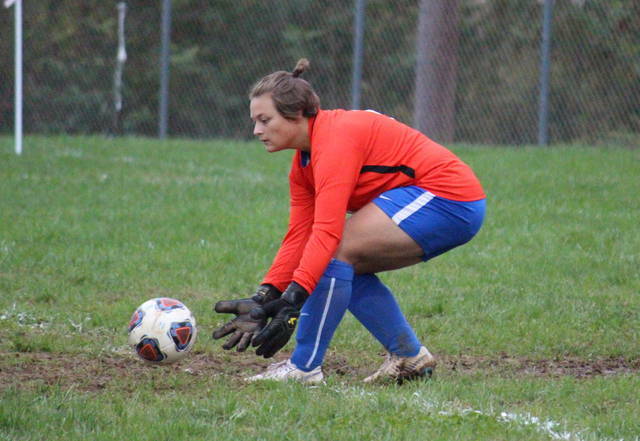 GAHS senior goal keeper Alexis Nickles stopped all-7 of the Lady Bulldogs’ shots on goal to keep scoreless tie at half. In the first 38 minutes of the second half, Athens claimed a 3-1 edge in corner kicks and all-5 of the game’s shots on goal, which were all stopped by Nickles. With 1:30 to go in regulation, Athens finally got a shot past the GAHS keeper, as a pass from Caroline Brandes set teammate Mariah Heflin up for a game-winning goal from six-yards out. After the match, GAHS head coach Leah Polcyn was proud of how her team played in the gut-wrenching setback. Polcyn also noted that, despite the seeding, she was concerned about the Lady Bulldogs experience, in comparison to her first-year program. She also acknowledged the similarities between this contest and their 0-0 draw with Point Pleasant in the regular season finale. “Coming into this game, I did not express my concern to my players, because I didn’t want to psych them out, but I was concerned about Athens,” Polcyn said. “They have an established program, they have a solid history, they’re known for having good soccer. The game-winning goal was the first score allowed by the Blue Angels since their 1-0 setback to Southeastern eight days prior. Gallia Academy has surrendered just three goals in the month of October. While sad about the season coming to a close, Polcyn was optimistic about the future following a successful first year. 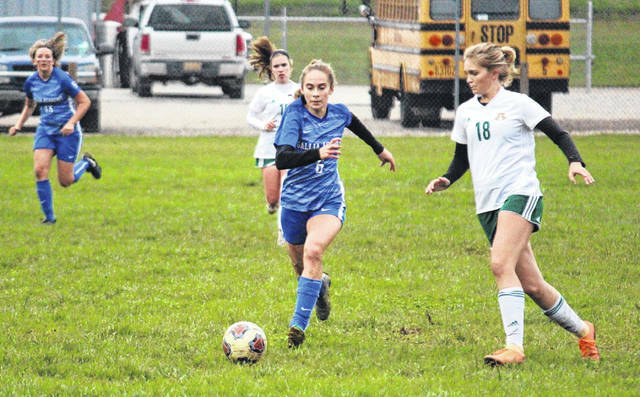 Gallia Academy finished the year on a seven-match streak of allowing one goal-or-fewer. In fact, only twice in their inaugural campaign did an opponent find the net multiple times in a match. The Blue Angels outscored opponents 40-to-16 in total, and went a perfect 8-0 en route to the Ohio Valley Conference championship. Polcyn hopes that her team will recognize all the success they’ve earned this season and keep their heads held high. This marks the final game in the Blue and White for Gallia Academy seniors Gretchen McConnell, Abby Cremeans, Alexis Nickles, Trinity Eggers and Katie Carpenter. Athens moves on to Saturday morning’s sectional final, which has the Lady Bulldogs visiting No. 2 seed Waverly. The Lady Tigers claimed a 5-0 decision over seventh-seeded Logan Elm on Tuesday.